Download ﻿wooden toy trains﻿ are inspired by the design of an eighteenth century switching engine by Alfred D Slater. This link will take you to 3D Warehouse, where you can view the Sketchup model. In the UK and other parts of the world it is also known as a shunting train, a compact workhorse used in a shunting yard to move both trains and carriages (or railway cars) in a marshalling yard. This project is intended to be a display model even though it is simple enough to be made by an ambitious beginner. When I first saw this plan, I was amazed at the level of detail, and knowing the level of skill amongst model makers out there, I thought the toy was to be made entirely out of wood. However, upon a random perusal of the text, I learned that the boiler was made from a cardboard tube. I was somewhat taken aback by this idea, far from being a purist, I thought it would be easy enough to turn a cylinder on a lathe. Reading further, the toy is painted in black enamel paint with aluminium and bronze paint for steel and brass with pipes of wire. 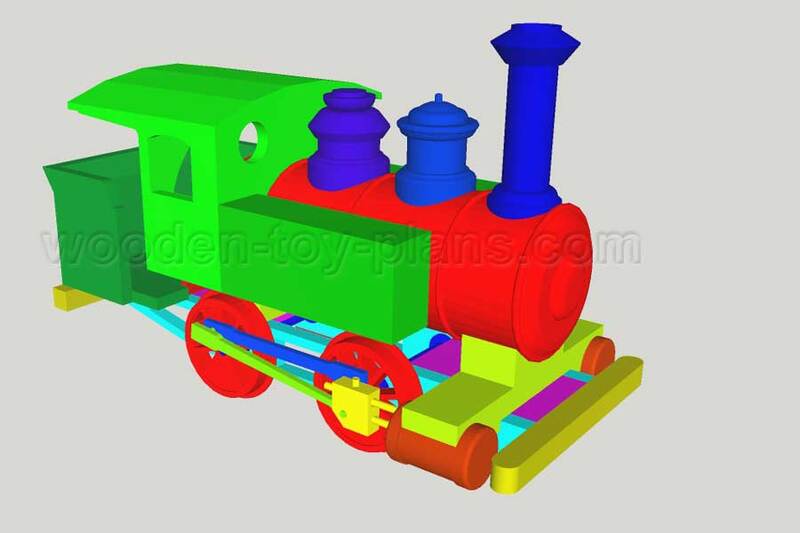 The information to make wooden toy trains includes drawings showing full size templates and a sketchup file, which includes a 3D animation sequence showing the construction. Besides all the normal tools most woodworkers already have, this is a short list of tools that you may need to complete this project. These construction notes are based on the original wooden toy train plans. Using 5/8" dowel stock, turn the axles on the lathe. Slide them into the frame bearing holes, insert a 1/8" by 5/8" by 1-3/4" spacer between each axle and the adjacent cross brace, and nail the spacers to the cross braces. Complete this assembly by gluing the wheels to the axles. Make the main and side rods from 1/8" stock. Mount the side rods on the 1/8" crank pins. Secure them to the forward pins with tacked on celluloid disks. Put the dowels spacers, as shown, on the rear pins, add the main rods, and tack on two more celluloid disks. For the moment, leave the forward ends of the main rods alone. Cut the saddle, boiler foundation, cylinders and steam chests to the right size, assemble them, and fasten them to the frame. Each cylinder has two holes. The upper one, 1/8" diameter, has a guide rod glued into it. The lower one, 5/32" in diameter, provides a sliding fit for the piston rod. Both cross head have the piston rods glued into them and slide on the guides. Attach the forward ends of the main rods to them with 1/8" dowels. A cardboard tube is used for the boiler. Put a filler piece in each end and nail the back head to the rear filler. There are two firebox foundations, as indicated, cut to fit under the aft end on the boiler. The forward one is fastened with two screws, the after one with three screws that pass first through the rear cross brace. The front end of the boiler is tied to the foundation and the saddle with a machine screw. Turn the steam dome, sand box and stack on the lathe and hollow the lower ends to fit the boiler. Cut the headlight from wood and the bracket from sheet metal. Make the boiler front in the lathe. Running boards and solid wood water tanks are assembled next and held in place with two dowels, through the boiler and the firebox. 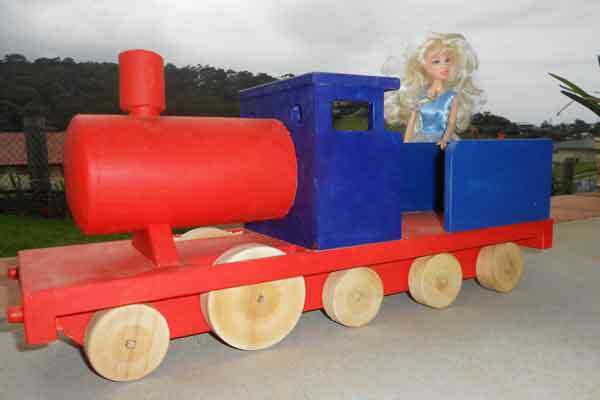 Easy to build wooden toy train for beginners with limited tools. Includes step by step construction notes. 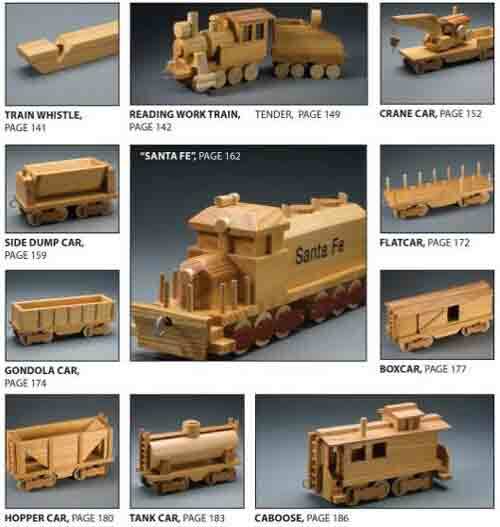 More wooden toy train plans included in books on toymakers wooden vehicles from well known authors such as Norm Marshall and Ralph S. Buckland. Free toy train plans from AOK Corral Craft and Gift Bazaar.